For a better economy, good jobs & healthy, safe buildings. 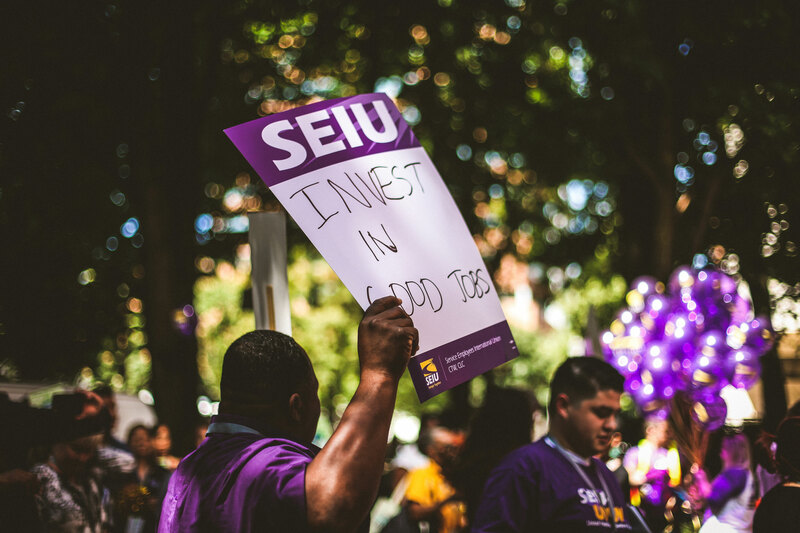 As the national movement for good jobs and fair wages swells, janitors, security officers, and airport workers from across the country are standing up to raise standards and improve jobs for all workers in our communities. Locally in Portland and SW Washington, janitors, security officers, and airport workers have joined together to raise standards, improve jobs, and highlight the issues associated with irresponsible janitorial and security contractors such as high-turnover, low pay, lack of dependability, lack of affordable healthcare, and all-around lower standards. By using responsible contractors in their market, building owners and other clients of subcontractors can take steps to ensure that subcontracted workers hold safe, good jobs and are treated with respect. Responsible contracting reduces the risk of labor disruption and lowers turnover—thereby increasing efficiency and workplace stability—by providing fair wages and benefits that workers deserve.